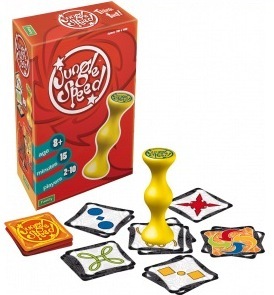 Bring some family fun and laughter to the table for game night! Count on your keen sense of observation and quick reflexes to get ahead in this game. The Jungle Speed game is engaging and exciting. The complete deck of cards featuring abstract images is divided evenly among all players. Place the cards face down in front of you. A bright yellow totem is then placed in the middle of the table. • Each player, in turn, reveals the top card of their draw pile. As players become more familiar with the symbols, they flip cards faster. Players are looking for identical cards. Colors have no significance, just the symbols. • If two cards are identical, those players must make a grab for the totem. The faster player then gets to dump off all their cards to their unfortunate adversary. • To add to the difficulty, certain symbols on the cards are almost identical, which can trick a player into grabbing the totem by mistake. • Just when players think they’ve got it down, one of three special cards can temporarily change the rules and keep them on the edge. Players may be called to make a grab at once, look for matching colors and not symbols, or even simultaneously flip cards. • The first person to get rid of all their cards wins the game! Get it at Target for less!